Bhubaneswar, India: England and Australia became the first teams to reach the final four of the Odisha Hockey Men’s World Cup Bhubaneswar 2018 thanks to victories in their respective quarter-final matches on Wednesday 12th December. England claimed a stunning 3-2 triumph over Olympic champions Argentina to book their ticket to the semi-finals, with Harry Martin’s fourth quarter strike proving decisive to set up a last four meeting with either Germany or Belgium, two teams that meet in the quarter-finals on Thursday 13th December. Reigning world champions Australia proved too strong for 20thranked France, powering to a 3-0 win to maintain their own ambitions to claim a third successive title. The Kookaburras’ semi-final opponents will be either host nation India or European champions the Netherlands, two sides that also go head-to-head tomorrow. The opening stages of the quarter-final meeting between Pool A winners Argentina (FIH Hero World Ranking: 2) and England (WR:7), winners against New Zealand in the cross-over play-offs, was a cagey affair, although England certainly had the better of the first quarter. Danny Kerry’s team saw a penalty corner effort blocked by the Argentina defence in what was England’s best chance of the period, before Los Leones – who defeated England in the bronze medal match at the 2014 World Cup in The Hague – hit the European nation with a sucker-punch at the start of the second quarter. The goal came through a very familiar source, Gonzalo Peillat finding the net with low and powerful penalty corner effort that England goalkeeper George Pinner half-blocked, but not enough to keep it out. 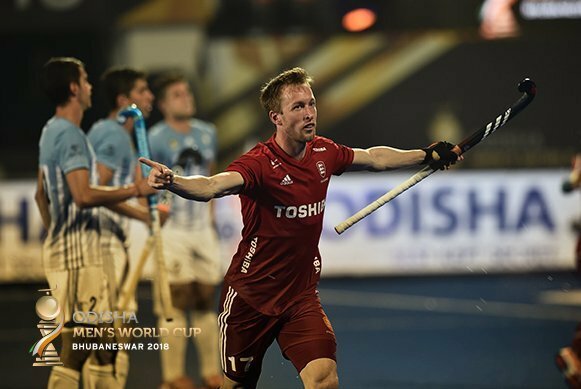 England dragged themselves level before half time when 34-year-old Barry Middleton rolled back the years with a stunning strike into the bottom corner, smashing home after a surging run into the Argentina circle from Odisha Player of the Match Liam Ansell. Things went from good to great for England at the end of the third quarter when Middleton sent an aerial pass deep into Argentine territory, with Will Calnan capitalising on a defensive error to drill a terrific effort past the left foot of Juan Vivaldi, putting his side in command ahead of a thrilling final fifteen minutes of play. A video referral by umpire Javed Shaikh saw a penalty stroke initially awarded to Argentina downgraded to a penalty corner. However, it made little difference, as Peillat showed once again why he is rated as the world’s finest drag-flicker by scoring his sixth goal of the tournament to tie the match at 2-2 with 12 minutes remaining. Incredibly, England regained the lead just a minute later, with Harry Martin forcing home after Argentina’s usually reliable defence failed to clear their lines. Argentina almost conceded a fourth goal when Ansell rattled the left post after a mazy run from deep in his own half, while Pinner was brought into action in the dying seconds to make a crucial block and confirm England’s place in the semi-finals for the third Men’s World Cup in succession. Despite being the top ranked team in the world and entering their quarter-final meeting against France (WR:20) on the back of a devastating 11-0 Pool B victory over China, Australia (WR:1) had no intention of taking their opponent from Europe lightly. It was hardly surprising, given the stunning victory Les Bleus claimed over Argentina in their final pool match. The Kookaburras were dominant throughout the first period, scoring the opening goal just four minutes in when Jeremy Hayward sent a low penalty corner drag-flick into the net, either side of both Trent Mitton and Jake Whetton hitting the frame of the France goal. A second Australian goal arrived four minutes into the second quarter, with Blake Govers bagging a penalty corner to move level with Gonzalo Peillat on six goals in the top scorer’s chart. France had a chance to pull a goal back when Timothée Clement created a good opportunity for Aristide Coisne, who managed to beat Australia goalkeeper Tyler Lovell only for Jeremy Hayward to clear the ball off the goal-line. Australia’s third and final goal arrived in the third quarter, again from a penalty corner situation. This time it was team captain and Odisha Player of the Match Aran Zalewski who found the net, flicking into an unguarded goal after two slick passes eliminated the majority of the France defence. It was the icing on the cake for the title holders, who enter the semi-finals with four wins from four matches and having conceded only once in 240 minutes of World Cup hockey in Bhubaneswar. While Australia were deserving winners, France’s outstanding performances here in Bhubaneswar earned them praise and admiration in equal measure. Their guaranteed top eight finish in the event is likely to reap rewards when the updated FIH Hero World Rankings are revealed at the end of the competition. The quarter-final phase of the Odisha Hockey Men’s World Cup Bhubaneswar 2018 will be completed on Thursday 13 December. Germany (WR:6) face Belgium (WR:3) at 16:45 IST (UTC +5.30), with the winner facing England in the semi-final. Australia’s semi-final opponents will come from the winner of Thursday’s second match, with host nation India (WR:5) playing the Netherlands (WR:4) at 1900.